Heat butter in a pan and add plain flour and saute until light brown. Add milk and stir well continuously till it thickens. Add beaten egg, mix well and allow to cool. 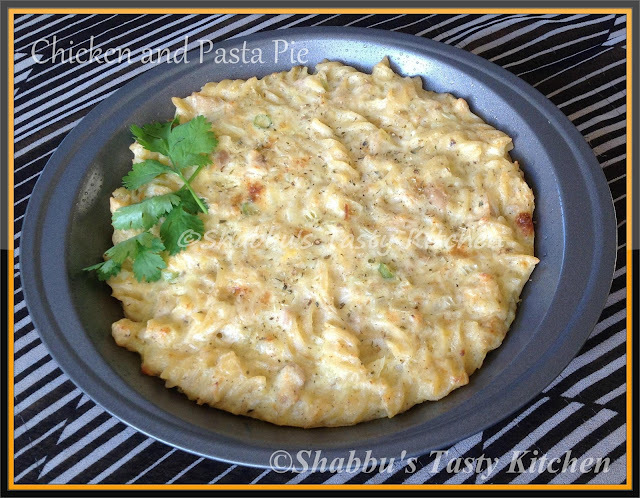 When it cools, add shredded chicken , onion, garlic, green chillies, cooked pasta and oregano and mix well. Pour the prepared pie mixture in a greased pie pan or baking dish. Can I have a slice dear??? Thats a wonderful n droolworthy pie. This is new to me.. Looks delicious and interesting..